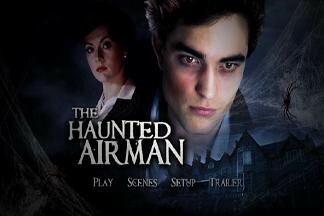 The Haunted Airman, starring Julian Sands, Robert Pattison and Rachel Stirling is a 70 minutes BBC TV production based on a novel by Dennis Wheatley (The Haunting of Toby Jugg). I thought it was a great choice for this time of the year as it is quite eerie; a mix between psychological drama and horror story. A young RAF bomber pilot is shot down. His wounds are considerable and he becomes a paraplegic in a wheel chair. His aunt Julia, a widow, decides to bring him to an asylum where the mysterious Dr. Hal Burns treats soldiers with post-traumatic stress disorder. The asylum is located in one of those huge English country houses. Toby suffers from different symptoms of post-traumatic stress. Nightmares, hallucinations, visions, phobias. He sees burning cities and dead civilians, relives the night in which he is shot down, imagines being attacked by giant spiders. Julia is his aunt by marriage. She is gentle and beautiful and Toby is clearly very much in love with her and dreams of marrying her. He writes to her frequently but she never replies. One day he finds out that the sinister doctor has kept back all the letters. From then on tragic and dramatic things happen. The end is a bit weird and mysterious. I didn’t mind watching this, it had a gothic, haunted house feel, the images were quite beautiful and Pattison and Sands act quite well. Still, I didn’t really know what to make of it all and didn’t get the end. I went to IMDb and saw that the reviews were extremely mixed. Either 8-10 or 1-2 stars. I’d say it’s a movie you either love or hate. Being a Robert Pattison fan would certainly influence the reaction. This entry was posted in Movie, Reviews, Uncategorized, War Movie, WWII and tagged BBC drama, Julian Sands, Movie, Post-traumatic stress, Rachel Stirling, Robert Pattison, The Haunted Airman, THe Haunting of Toby Jugg, TV Movie, War Movie, WWII. Not interested. It looks like you are approaching having seen every war movie ever made. Some of your recent choices have been rather obscure. If you had trouble understanding the ending, imagine the trouble mere mortals will have. Thanks for the warning. I don’t like to get headaches. I agree, this isn’t for you at all. But I like eerie movies and enjoyed parts of it.